The day everyone either awaited or feared arrived. 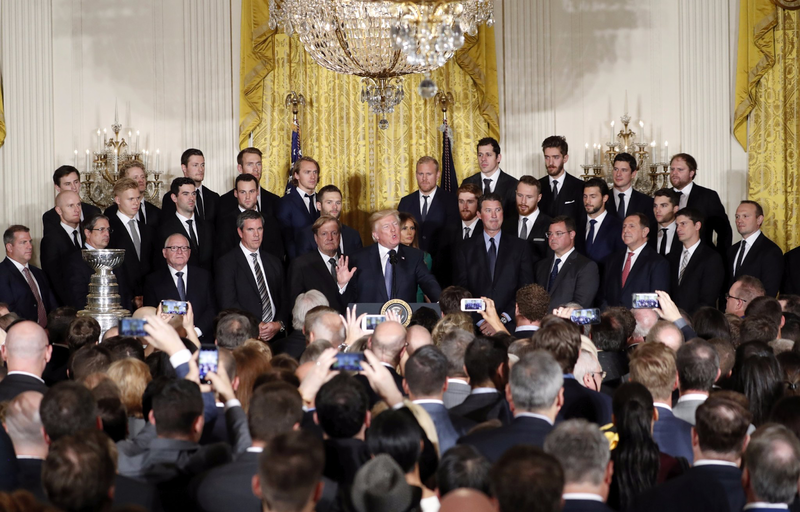 The Penguins were going to meet with Donald Trump in the White House. It was a polarizing moment that, sexist comment about Amanda Kessel aside, went about as smoothly as it could have gone. It was a controversy weeks in the making. Everyone had an opinion. You were either "stick to sports" or "don't normalize this behavior." Externally the lock room was committed to the company line, "It's not about politics" as we further delved in to a world where "not about politics" no longer became an option. But banner raisings, blow out losses, and finally victories kept pushing aside the fact that the Penguins, really, just wanted to play hockey. Tone deaf or just not wanting to rock the boat, it's hard to say. Hockey, by nature, is a game of the upper crust. The cost of equipment makes it hard for anyone but those with a desire, and money to burn, to become a player and become accepted. It spun narratives, one way or the next, as these situations are wont to do. "Sidney Crosby is a racist." seemed to be a popular overture, a new take on "Sidney Crosby is a whiner" that really isn't much better or factual. Asked if he would have a problem with one of his players taking a knee during the national anthem, #Pens coach Mike Sullivan said no. Fortunate to escape being used as pawns as the NBA and the NFL have been by the current administration (perhaps the "this isn't political" comments were made to dull that possibility) the Penguins now move on to hockey and a three-peat. Gone is the controversy. Gone is the fear that they'll be tainted. Vanished is the worry that they'll unwittingly partake in some sick endeavor brought up by what ever thought enters the mind of someone at a mic. All that's left is sport. And thank God for that. It's a great day for hockey, now let's play.